New Paltz, N.Y. (May 16, 2017) - As part of Cider Week Hudson Valley, Historic Huguenot Street will host its third annual hard cider market and tasting on Saturday, June 10. This event was originally developed to celebrate the historic and contemporary significance of cider production in the Hudson Valley. 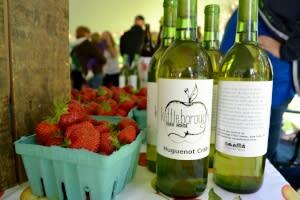 Over the years, the market has expanded to feature products from a broader range of regional New York State cideries, as well as offerings from local wineries, breweries, and food trucks. In addition to ciders, vendors will be selling other products from their orchards and farms as well, including fresh cut flowers, local apples, apple cider donuts, and more. Local bands will perform live throughout the day. The market will take place on the Deyo House lawn across from the DuBois Fort (81 Huguenot Street) and will be open from 12 – 4 pm. Early Bird admission is $15 through May 31, which grants access to unlimited tastings for the duration of the market. General admission is $20 beginning June 1. Guests tasting cider must be 21+, with ID for documentation. Designated drivers receive free admission. The first 100 people to arrive will receive a free tasting glass. Pre-registration is encouraged; those who register in advance at www.huguenotstreet.org/cidermarket. A National Historic Landmark District, Historic Huguenot Street is a 501(c)3 non-profit that encompasses 30 buildings across 10 acres that was the heart of the original 1678 New Paltz settlement, including seven stone houses that date to the early eighteenth century. It was founded in 1894 as the Huguenot Patriotic, Historical, and Monumental Society to preserve the nationally acclaimed collection of stone houses. Since then, Historic Huguenot Street has grown into an innovative museum, chartered as an educational corporation by the University of the State of New York Department of Education, that is dedicated to protecting our historic buildings, conserving an important collection of artifacts and manuscripts, and promoting the stories of the Huguenot Street families, from the sixteenth century to today.